Bhansali joined the FIU family in 2011 with a vision to grow the Department of Electrical and Computer Engineering. His goals were to increase the number of faculty members, create new programs for students and modify existing ones, and bring in more research awards for faculty and students to have opportunities to work on impactful research projects. In 2011, the department offered only five programs. Fast forward to 2018, the department now offers eight degree programs and 20 areas of concentration. Under his leadership, the department created a bachelor’s degree in Internet of Things (IoT), making FIU the first university in the nation to offer this degree. Several areas of concentration have also been added including pre-medical and physics tracks, for students with dual interests in engineering and science. The department has also been ranked in U.S. News and World Report and the American Society for Engineering Education (ASEE). Bhansali’s research focuses on bio-sensing, bioengineering, oceanographic sensing, materials science, micro/nanotechnology and alternative energy. He leads the Bio-Mems and Microsystems Laboratory at FIU, where he and his students (ranging from undergraduate students to postdoctoral researchers) work on innovative projects pertaining to benefiting people’s health. For instance, Bhansali and his team are developing a single generic sensor that would be capable to identify cells based on their bio-impedance maps. They are also creating a wearable alcohol sensor to help individuals know right away their alcohol levels and monitor their alcohol intake. As for student success, Bhansali has worked immensely hard to encourage students, from any background, to pursue degrees in STEM. He serves as the co-director for the Bridge to the Doctorate Fellowship Program, funded by the National Science Foundation (NSF). The Bridge to the Doctorate Fellowship Program helps minority students obtain degrees in the STEM field by offering them a full-tuition scholarship, an annual living stipend and mentorship. The program was created to recognize the importance of having a diverse student body population that will transition into the workforce upon graduation and provide innovative ideas to improve the nation’s global economic leadership. Bhansali has also led a number of interdisciplinary graduate student research and training programs with the mission to increase the diversity of students, retention and graduation rates. He has been a mentor to more than 150 graduate students with fellowships in the College of Engineering & Computing, College of Arts, Sciences & Education and Herbert Wertheim College of Medicine. The tradition of AAAS Fellows began in 1874. In order to be named a fellow, the AAAS member must be nominated by the steering groups of the association’s 24 sections, by any three fellows who are current AAAS members or by the AAAS chief executive officer. Fellows must have been in the organization for at least four years. 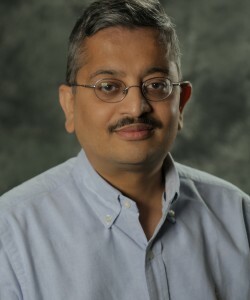 The new fellows will receive an official certificate and a gold and blue rosette pin on Saturday, February 16, 2019, at the AAAS Fellows Forum taking place during the 2019 AAAS Annual Meeting in Washington, D.C.
Congratulations to Bhansali for becoming an AAAS Fellow, for his dedication to FIU, his research and most importantly, for being a source of knowledge to his students and providing them with unique opportunities to achieve their dreams of becoming engineers. For a list of all the 2018 elected AAAS fellows, click here.